Birthplace : Los Angeles, California,U.S. Jerrald King "Jerry" Goldsmith was an American composer and conductor most known for his work in film and television scoring. Jerry Goldsmith's work includes hundreds of scores for film and television. Incredibly versatile and acclaimed by his peers, critics, and audiences alike, he is as popular as he is prolific. During the 1960s, when he was most active, he composed the scores for an average of six films every year. His work includes scores for television shows like The Twilight Zone, The Man from U.N.C.L.E., Gunsmoke, and many others. His film work in the 1960s included The Illustrated Man, The Planet of the Apes, and The Agony and the Ecstasy; in the 1970s, Star Trek, Alien, Capricorn One, Coma, and The Boys from Brazil; in the 1980s, Gremlins, Poltergeist, and the Rambo movies; in the 1990s, The Medicine Man, Basic Instinct, Total Recall, and many others. His work in the 2000s has included Star Trek X: Nemesis, Sum of All Fears, and The Last Castle. Goldsmith himself summed up the ubiquity of his music in the Daily Yomiuri of Tokyo, Japan, when he said "A few years ago the BBC [British Broadcasting Corporation] did a survey and they said that every minute of every day, a piece of my music is being played somewhere in the world. That's good for my ego." Goldsmith, who had decided he wanted to become a composer by the time he was 14 years old, studied music at the University of Southern California. It was Alex North's score to A Streetcar Named Desire that first sparked his interest in the field. He chose to move into radio, film, and television partly for pragmatic reasons. "I was accustomed," he told the Herald of Glasgow, Scotland, "to certain middle-class comforts which I didn't want to give up for the sake of art. I loved drama, and I loved movies. What a way, it seemed to me, to write music and make a living." His first job out of college was as a clerk and typist at the offices of CBS television, and by 1950, he had worked his way into the music department. His first assignments were for radio programs such as Romance and CBS Radio Workshop. The studio's fast-paced schedule had Goldsmith composing a score a week for these shows, which were broadcast live each week. Graduating to composing for television at CBS in 1955, Goldsmith began with one-hour shows that also were broadcast live once a week. "We had limited resources, a tiny orchestra, and, doing it live, you never knew what was going to happen next," he told the Herald. "It was an incredible learning experience." Among his assignments during this period was composing music for Playhouse 90, a series of 90-minute television dramas that were broadcast live, and for numerous television series including Gunsmoke, Perry Mason, Have Gun, Will Travel, The Twilight Zone, The Man from U.N.C.L.E., and others. It was The Twilight Zone that Goldsmith remembered most fondly in later years for its innovative approach to television in general, and to music in particular. As he told the Herald, "I was allowed total freedom of imagination. The wilder it was the better. They said I could try anything, any experiment, just to see if the instruments could do it, just to see what different combinations of sounds would be like." Goldsmith left CBS in 1960 to work at Revue Studios, where he composed music for the studio's thrillers. At the studio he came under the wing of legendary film composer Alfred Newman, one of the most highly regarded film composers in Hollywood history. Newman hired Goldsmith to score his first major motion picture, Lonely are the Brave, released in 1962. Goldsmith built his career through the 1960s, quickly becoming one of Hollywood's busiest composers. Goldsmith enjoys the variety the work offers him. His style is not instantly recognizable, mostly due to the fact that he works in so many genres. He also has a penchant for experimentation, best heard in Planet of the Apes. The variety of his work gives him the opportunity, he told the Herald, to compose for everything from "a comedy to a western to a psychological drama to a romance.... That's why I enjoy doing films so much: to be able to go from The Boys from Brazil, where I was writing ersatz Wagner--and pretty damned pleased I was with it--to some silly comedy and then some jazz, and then to The Omen, where I got the idea of using voices, took the Mass, and switched it around so it worships the devil instead of Christ." Goldsmith's score for The Omen was so successful and spot-on that it set the standard for the scores to future films of the same sort. Goldsmith himself reused some of the ideas from The Omen's score in the sequels to the film, The Omen IIand The Final Conflict. Asked by the Washington Post to describe the process by which he composes a film score, Goldsmith said that he waits until a movie is as complete as possible before sitting down to write the music. "I can't get ideas from a script," he said. "One can look at a piece of music and envision the sound, or look at a painting and get the idea, or even read a play and imagine; but a script is just a blueprint and what comes on the screen is so totally different that you can't really conceive of it until you see it." He also waits in order to make the score as perfectly tied to the action on the screen as possible. "We write to the 10th of a second; a foot changes and it throws off the music." Although he is perhaps best known for his work on science fiction films, that is not Goldsmith's favorite genre. As he told Japan's Daily Yomiuri, "I like to write music about people and relationships, not about machines and weird things. Some of my favorites would be movies like Rudy, Russia House or Patton. But Hollywood has this way of typecasting you and that's how I've been typecast. I'm associated with big, extravagant films." Goldsmith has been called on numerous times to rescore films that, at the last second, didn't meet the directors' expectations. He wrote the score for Air Force One in only four and a half weeks, after the score written by the original composer, Randy Newman, was rejected. He pulled off an even more remarkable feat when he wrote the impressive score for Chinatown in only ten days. That score is considered by many to be one of his finest. Nominated for numerous Academy Awards, Goldsmith had won only one by 2002--for his score of The Omen, released in 1976. In addition to scoring films and television shows, Goldsmith also tours, conducting his music for orchestras around the world, including the San Diego Symphony and the Royal Philharmonic of Britain. He sometimes collaborates on projects with his son, Joel Goldsmith, who is also a film and television composer. Their collaborations include Star Trek: First Contact and Runaway. In addition, Goldsmith teaches a graduate course in music composition at the University of Southern California, where he studied the same subject years before. Goldsmith's final theatrical score, composed during declining health, was the critically acclaimed music for the live action/animated film Looney Tunes: Back in Action (2003), directed by long-time Goldsmith collaborator Joe Dante. His last collaboration was with another long-time collaborator, Richard Donner (for whom Goldsmith had scored The Omen in 1976), on the science fiction film Timeline (2003). However, due to a complicated post-production process, Goldsmith's score was rejected and replaced by a new score by composer Brian Tyler. Goldsmith's rejected score was later released on CD, 7 September 2004 through Varèse Sarabande, not long after his death in 2004. Goldsmith passed away at his Beverly Hills home 21 July 2004 after a battle with colon cancer at the age of 75. -City of Fear , Best, 1959. -Studs Lonigan , Tsunami, 1960. -Lonely are the Brave , Best, 1962. -Lillies of the Field , PEG/Tsunami, 1963. -The Prize , MGM, 1963. -The Stripper , FSM, 1963. -Rio Conchos , Intrada/FSM, 1964. -Agony & The Ecstacy , Intrada, 1965. -A Patch of Blue , Intrada, 1965. -In Harms Way , SLC/Intrada, 1965. -Von Ryans Express , Tsunami, 1965. -The Blue Max , Sony/Varese, 1966. -Our Man Flint , Varese, 1966. -Trouble with Angels , Mainstream, 1966. -Flim Flam Man , FSM, 1967. -Hour of the Gun , Intrada, 1967. -In Like Flint , Varese, 1967. -Planet of the Apes , Varese, 1968. -The Illustrated Man , FSM, 1969. -100 Rifles , FSM, 1969. -The Ballad of Cable Hogue , Varese, 1970. -Brotherhood of the Bell , FSM, 1970. -Rio Lobo , Prometheus, 1970. -Tora, Tora, Tora , Club, 1970. -The Travelling Executioner , FSM, 1970. -Escape from the Planet of the Apes , Varese, 1971. -The Last Run , CHP3, 1971. -Mephisto Waltz , Varese, 1971. -Wild Rovers , CHP3/Memoir, 1971. -The Other , Varese, 1972. -Ace Eli Roger of the Skies , FSM, 1973. -A Girl Named Sooner , FSM, 1975. -Take a Hard Ride , FSM, 1975. -The Wind & The Lion , Intrada, 1975. -Breakheart Pass , Pony Tail, 1976. -Logan's Run , FSM/CHP3, 1976. -The Omen , Varese, 1976. -Cassandra Crossing , RCA, 1977. -High Velocity , Prometheus, 1977. -Islands in the Stream , Intrada, 1977. -Twilights Last Gleaming , Silva, 1977. -The Boys from Brazil , Varese, 1978. -Capricorn One , Crescendo, 1978. - Damien Omen II , Varese, 1978. -The Swarm , Premetheus, 1978. -Star Trek: The Motion Picture , Sony, 1979. -Cabo Blanco , Prometheus, 1980. -The Final Conflict: Omen III , Varese, 1981. -Night Crossing , Club, 1981. -Raggedy Man , Varese, 1981. -First Blood , Intrada/Varese, 1982. -The Challenge , Prometheus, 1982. -Secret of Nimh , Varese, 1982. -Psycho II , Varese, 1983. -Twilight Zone: The Movie , Warner Bros., 1983. -Under Fire ,Warner Bros., 1983. -Lonely Guy , MCA, 1984. -King Solomons Mines , Intrada/Milan, 1985. -Rambo: First Blood , Silva, 1985. -Poltergeist II: The Other Side , Intrada/Varese, 1986. -Extreme Prejudice , Intrada/Silva, 1987. -Rent a Cop , Intrada, 1987. -Rambo III , Intrada, 1988. -Star Trek V: The Final Frontier , Epic, 1989. -Gremlins 2: The New Batch , Varese, 1990. -Not Without My Daughter , Intrada, 1990. -The Russia House , MCA, 1990. -Total Recall , Varese, 1990. -Love Field , Varese, 1991. -Mom & Dad Save the World , Varese, 1991. -Sleeping with the Enemy , Columbia, 1991. -Basic Instinct , Varese, 1992. -Forever Young , Big Screen, 1992. -Medicine Man , Varese, 1992. -Mr. Baseball , Varese, 1992. -Dennis the Menace , Big Screen, 1993. -Six Degrees of Seperation , Elektra, 1993. -Bad Girls , Fox, 1994. -The River Wild , RCA, 1994. -The Shadow , Arista, 1994. -Fierce Creatures , Varese, 1995. -First Knight , Epic, 1995. -Chain Reaction , Varese, 1996. -City Hall , Varese, 1996. -Executive Decision , Varese, 1996. -The Ghost & the Darkness , Hollywood, 1996. -Star Trek: First Contact , Crescendo, 1996. -Air Force One , Varese, 1997. -The Edge , RCA, 1997. -LA Confidential , Varese, 1997. -Deep Rising , Hollywood, 1998. -Mulan , Disney Records, 1998. -Small Soldiers , Varese, 1998. -Star Trek Insurrection , Crescendo, 1998. -The Haunting , Varese, 1999. -The Mummy , Decca, 1999. -The 13th Warrior , Varese, 1999. -Hollow Man , Varese, 2000. -Along Came a Spider , Varese, 2001. -The Last Castle , Decca, 2001. -Sum of All Fears , Elektra, 2002. -Star Trek X: Nemesis , Varese, 2002. -Desperate Mission , Silva, 1969. -Contract on Cherry Street , Prometheus, 1977. 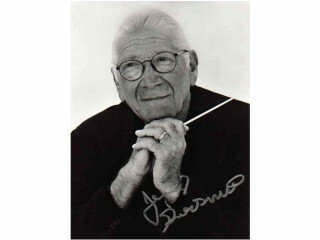 View the full website biography of Jerry Goldsmith.